SCITEK to present Novel Airjet Exciter System at NIDays in November. 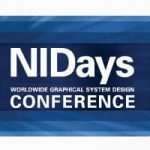 SCITEK will be giving a presentation on Determining the Fatigue Life of Aero-Engine Blades using their Airjet Exciter System at this year’s National Instruments Conference in November. This annual technical conference and exhibition will bring together more than 600 engineers, scientists and educators representing a spectrum of industries, from automotive and telecommunications to robotics and energy. It will provide an excellent opportunity to learn about the latest technology to accelerate productivity for software-defined systems in test, measurement and control. Come and visit our stand to discuss your engineering challenges.